My glass bowls are handcrafted, one-of-a-kind pieces. I create them by slumping glass into various shapes in the kiln, edging them with copper foil and lead-free solder, then embellishing them with decorative items. I also fire images into some of the bowls, using gold or platinum luster. I further enhance my creations with charms and images from nature: leaves, flowers, dragonflies, hummingbirds, goldfish, and turtles. Sometimes I use elements from Asian design: Chinese letters for love and friendship, and Buddha charms. I add beads of infinite variety to adorn my bowls, either alone or in combination with charms and images. I have also developed a beautiful "jewel on glass" style by decorating my bowls with vintage jewelry. Please keep in mind when ordering, that each bowl is unique, but will be similar to the bowl pictured. I will work with you to create the design and color of bowl that you would like. Ordering is easy! 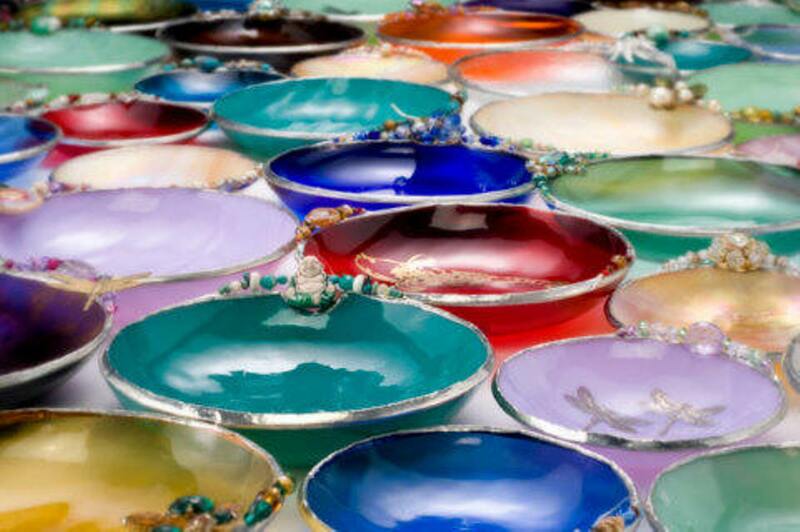 Simply tell me what type, size, and color glass you desire. Each one-of-a-kind piece is handmade to your specifications. You choose whether to add beads or jewelry. Each piece is unique, so the beading will always look a little bit different from its picture. The addition of vintage jewelry depends on my stock at any given time. My constant goal is to turn your imagination into a beautiful, personal reality.